Yesterday’s SCOTUS decision was not magically undone overnight by benevolent fairies, so it looks like it’s up to us. Yes, this decision stinks on ice. And Yes, it means we have only one choice going forward: REPEAL IT. Actions like this were anticipated over 200 years ago. It’s not as if the founding fathers didn’t have a little experience dealing with an oppressive government. Not being a Constitutional scholar, I can’t quote chapter-and-verse from Franklin, Adams and the rest off the top of my head. However, I wasn’t sleeping through classes (not most of them, anyway), and I do recall some of their writings. Of all of our country’s elite thinkers at our nation’s beginning, the one person who wrote most eloquently, to me, was probably Thomas Jefferson although he had some beliefs with which I do not hold. There was a reason the man wrote the Declaration, after all. I’d ask you to recall some of those writings today, and see if they don’t apply directly to what we are currently experiencing. 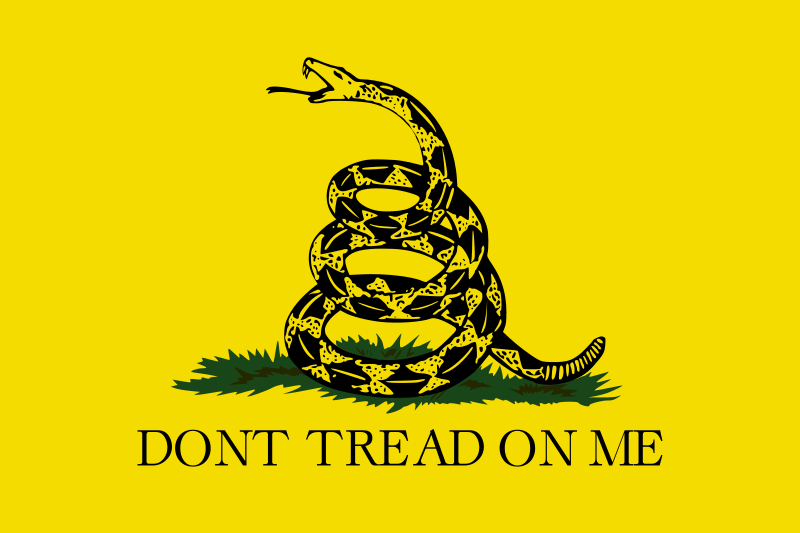 “The two enemies of the people are criminals and government, so let us tie the second down with the chains of the Constitution so the second will not become the legalized version of the first.” (***There is some disagreement on this one, regarding whether or not this can be directly attributed to Jefferson. Regardless, it is perfectly applicable, so I’m including it). “I predict future happiness for Americans if they can prevent the government from wasting the labors of the people under the pretense of taking care of them. These quotes (and there are numerous others) sum up what we’ve just seen: a government declaring absolute control over the will, lives and bodies of its people, all in the name of “compassion” and “fairness”. It happens with the EPA, the TSA and the rest of the government alphabet soup. 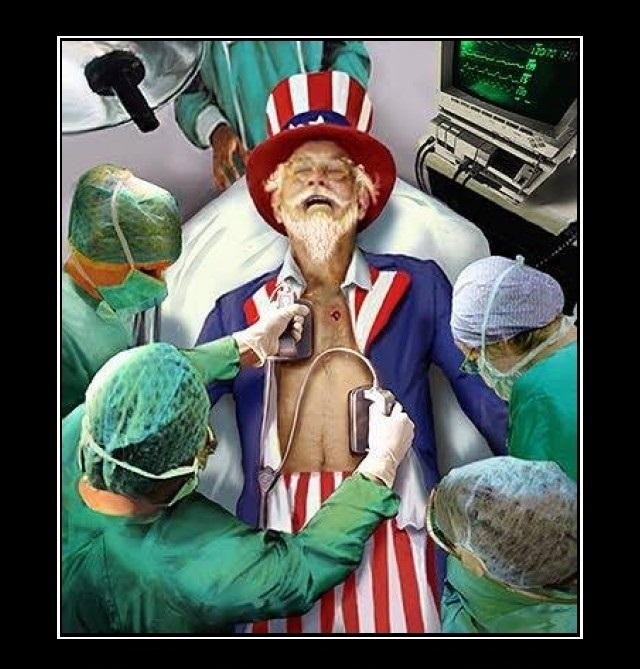 Obamacare is just the coup de grâce. It was intimated in the ruling yesterday that the “The Patient Protection and Affordable Care Act” was enacted as the result of our duly elected leaders legislating on our behalf. Sorry, but that simply doesn’t wash. Our elected officials didn’t get elected based on a promise of the takeover of healthcare. Worse, those representatives in favor of it subsequently lied about their rationale once they introduced the topic. Furthermore, even after 2+ years since Obamacare’s passage, most voters still would like to see the law repealed. So, how can this be the will of the people? It can’t, because it isn’t. This isn’t a simple policy difference which occurs in normal, day-to-day politics. This is an essential departure of our country’s founding, and it cannot be tolerated. We are being told that if we do not live in a way in which the Federal Government approves, we will be punished, and that punishment is up to them. Anyone that thinks this won’t lead to even more egregious losses of liberty is either stupid or naïve. If we simply roll over, shrug our shoulders and say “oh, well; win some and lose some“, we won’t have lost some; we’ll have lost everything. 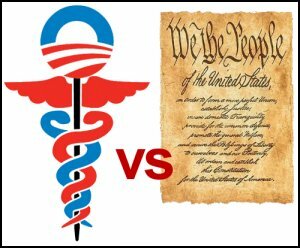 The word just came down from the Supreme Court regarding Obamacare: even though Obama himself insisted, repeatedly, that this was not a tax, it was ruled constitutional on the grounds that…it’s a tax. One of the saddest days of our lifetimes. This is a complete takeover of our lives. Everything, …everything….can be said to pertain to health. As I sit here, there is literally no aspect of daily life that I can’t imagine this impacting. If allowed to stand, this is a death knell to both our secular and religious freedom. We really have only one choice now: ignore them. Ignore the ruling; ignore the mandate; call/write/email your representatives, and tell them what you think of this. Tell them to tell Washington to take their Obamacare and its mandated “tax” and to place them both where sunlight won’t find ’em, IYKWIMAITYD. You can sit on the sidelines, wringing your hands and cursing the sky, or you can act. Peacefully, of course, yet act. An unjust law is not a law, and this is one of the most unjust laws of our country’s history. STOCKTON, CA, said it will file for bankruptcy after talks with bondholders and labor unions failed, making the agricultural center the biggest U.S. city to seek court protection from creditors. The budget for the fiscal year beginning July 1 calls for defaulting on $10.2 million in debt payments and cutting $11.2 million in employee pay and benefits under union contracts that could be voided by the bankruptcy court. The city of 292,000 may file its petition as soon as today. Hey, you know what would have been an option prior to this? I’m thinkin’….maybe to not spend so much money?? I know….that’s just silly; heck, it’s crazy talk. If the municipalities and/or school districts were given a real option between what the public sector unions say they HAVE to do, and what makes the most SENSE, those municipalities and school districts might actually take….the option that makes the most sense. 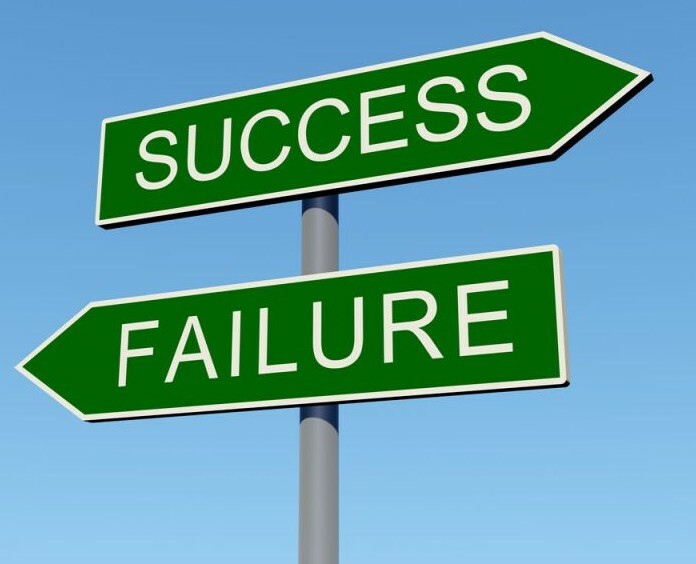 Make the common-sense fiscal decisions, and then don’t yield to the Public Sector Unions = SUCCESS!! Punt on all the tough decisions, keep raising taxes, and/or cave to the Public Sector Unions = BANKRUPTCY. Yeah, I think I can remember that. The 4th of July is only a week from today, so I thought it would be appropriate to start contemplating what all the hubbub will be about. This old video, courtesy of our good friend ‘Phoebe’s Detention Room’, highlights a classic interpretation of our Nation’s Pledge. Please watch all 4 minutes, since it is almost eerily prophetic at the very end. 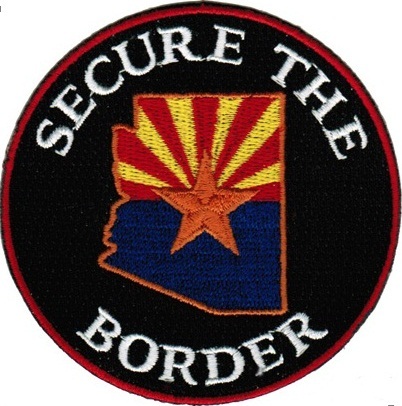 It appears that Obama and his minions are completely willing to see the divide on illegal immigration devolve into chaos, since his Immigration and Customs Enforcement (ICE) agency has already indicated that they won’t be taking any calls from Arizona going forward. It takes a small, petty man to make such a small, self-interested decision. President Populist is just such a man. On Monday, the U.S. Immigration and Customs Enforcement (ICE) agency suspended the federal program known as 287(g) for Arizona, which allows local law enforcement to investigate a suspect’s immigration status after an arrest had been made for any offense. The program has been highly effective in identifying criminal aliens at the local level. The decision came only hours after the U.S. Supreme Court announced their decision to let stand the portion of Arizona’s immigration law which requires local law enforcement during routine stops to check the immigration status of anyone they suspect is here illegally. According to the Department of Homeland Security, 287 (g) agreements are “not useful” in states that have enacted SB1070-type laws. So, even if local law enforcement arrests an illegal alien, their requests to ICE are likely to fall upon deaf ears and the suspect will simply be released. This has been discussed quite a bit in the last 24 hours, and by folks several orders of magnitude smarter than me. BUT: there is a factor missing. I want to highlight it, because I made this exact point months ago with a couple of my buddies. And it’s something that I haven’t heard from anyone else other than Levin last night. Hey, if I have to agree with someone, I’m happy to have the “Great One” on my side. On his Monday show, conservative radio host Mark Levin explained why yesterday’s Supreme Court ruling on SB 1070, the controversial Arizona immigration law, could pave the way for legal action against “sanctuary” areas that welcome undocumented immigrants. 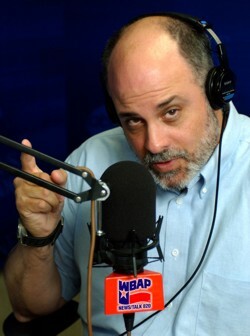 Levin, the author of “Ameritopia: The Unmaking of America,” first expressed his disappointment in Chief Justice John Roberts for signing on with the decision, which dismantled much of the Arizona law while upholding a section that allows law enforcement to force suspected immigrants to show documentation that proves their legal residency. However, Levin said, if states can no longer set policies dealing with someone’s immigration status, then sanctuary cities or states may find themselves in hot water. Now obviously I’m no lawyer, but this point seemed rather obvious even to little ol’ me. That’s why I was surprised that no one else seemed to be making it. It’s also why I didn’t dwell on it for awfully long: I just figured there must be more to it which my non-lawyerly brain didn’t properly comprehend. That may still be the case, but it doesn’t change the fact that Levin’s law firm, Landmark Legal Foundation, also reached the same conclusion in a brief published earlier this year, noting a decision similar to the one yesterday would create “chaos and confusion”. If the federal government’s politically motivated challenge of SB 1070 is successful, rather than bring consistency and certainty to immigration on a national level, it will create even more chaos and confusion. The federal Executive Branch’s selective and inconsistent application of field preemption in immigration law must not be given this Court’s imprimatur. Otherwise, lawless state and local governments that have adopted sanctuary policies that directly violate federal immigration law and have not been challenged by the Executive Branch will continue to be lawless. Conversely, law-abiding governments that help enforce federal immigration law will be without direction. The illegal immigration issue (and it’s important to remember to include the word ‘illegal’ here) is only going to grow more rancorous and divisive, as a direct result of Obama’s actions. 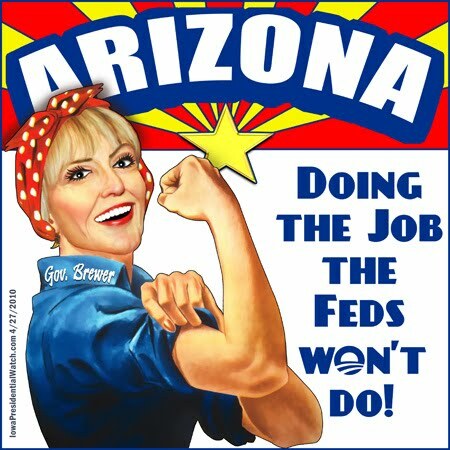 However, Arizona didn’t pick this battle: they just decided to fight back. I have sided with them from the start, and my reason is simple: the Arizona law is a direct outgrowth of that state’s frustration over our own Federal Government’s failure to secure the border. This law would be superfluous if that were to happen. ALL other methods they choose to rationally deal with this issue need to be viewed through the prism of being told, point-blank, by Uncle Sam, “No, the US gov’t won’t protect you, and you can’t protect yourself, either”. Well, they are protecting themselves, and God Bless ‘em for having the spine to do so. I’m not from Arizona, but I can certainly understand their plight. In the face of an increasingly hostile Federal Government, I am completely on the side of the State, any state, which is merely trying to fulfill their obligation to protect their legal citizens. So basically this is a data-mining corporation, or database marketer. In business since 1969, they have progressed from usage of the telephone book to legal plundering of the internet, amassing a portfolio which includes over 190 million people and 126 million households in the U.S. alone. — and on and on. Armed with all this and more, they go to work. (Acxiom) uses it to pigeonhole people into one of 70 very specific socioeconomic clusters in an attempt to predict how they’ll act, what they’ll buy, and how companies can persuade them to buy their products. It gathers its data trove from public records, surveys you’ve filled out, your online behavior, and other “disparate sources of information”, then sells it to banks, retailers, and other buyers. And don’t forget about Uncle Sam. Seriously, what are the odds that they DON’T want more info on all of us? Which ultimately means that the list of people who don’t have all of my personal information is getting smaller than the list of those who do. Over recent years a range of miniature drones, or micro air vehicles (MAVs), based on the same physics used by flying insects, have been presented to the public. The fear kicked off in 2007 when reports of bizarre flying objects hovering above anti-war protests sparked accusations that the U.S. government was accused of secretly developing robotic insect spies. 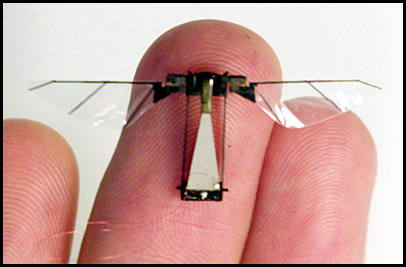 ….the US Air Force unveiled insect-sized spies ‘as tiny as bumblebees’ that could not be detected and would be able to fly into buildings to ‘photograph, record, and even attack insurgents and terrorists.’ Around the same time the Air Force also unveiled what it called ‘lethal mini-drones’ based on Leonardo da Vinci’s blueprints for his Ornithopter flying machine, and claimed they would be ready for roll out by 2015. Ya’ know, living off the grid in a cabin in Montana keeps looking better and better to me. In the last few weeks we’ve covered other similar stories, which made me just as uneasy. As a result, I really shouldn’t be surprised that there is a faceless company out there aggregating a huge dossier on me in order to accurately predict my behavior, any more than I should be shocked that the wasp or hornet buzzing near my patio may actually be a lethal electronic drone spy. What if these two companies start working together? (Courtesy of the Constitution Club blog)…… ***This issue has been roundly ignored by the press for over a year. On the rare occasions when it IS addressed, it’s largely ridiculed by the Left & the Media (sorry for repeating myself there). We’ve written about this here several times, so consider this a ‘refresher course’ on F&F. Be sure to read it and then watch the excellent, ..and terrifying, …video from Bill Whittle. 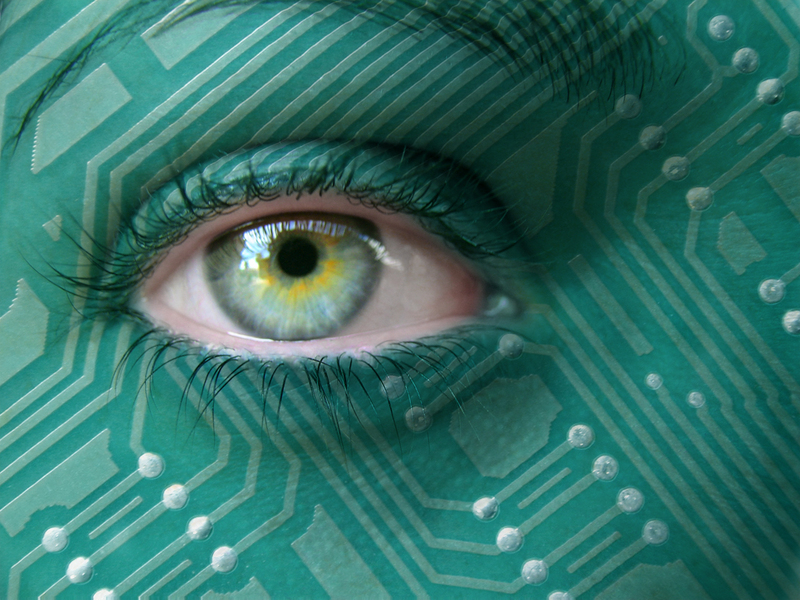 You can be forgiven if the Senate vote on S.3240 didn’t actually register on your consciousness. It made a splash in the news like a pebble does in the Atlantic: none. For those of you unfamiliar with what the bill covers, we discussed it here a short time ago. And from the sounds of it, Senator Ron Johnson read our post. 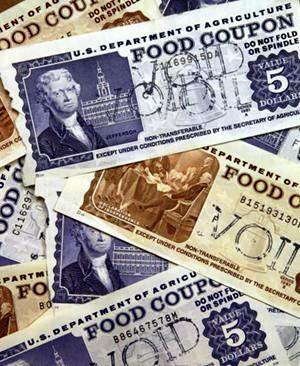 “The 2012 Food Stamp bill – more commonly known as the ‘2012 Farm Bill’ – will spend about $995 billion over the next ten years. 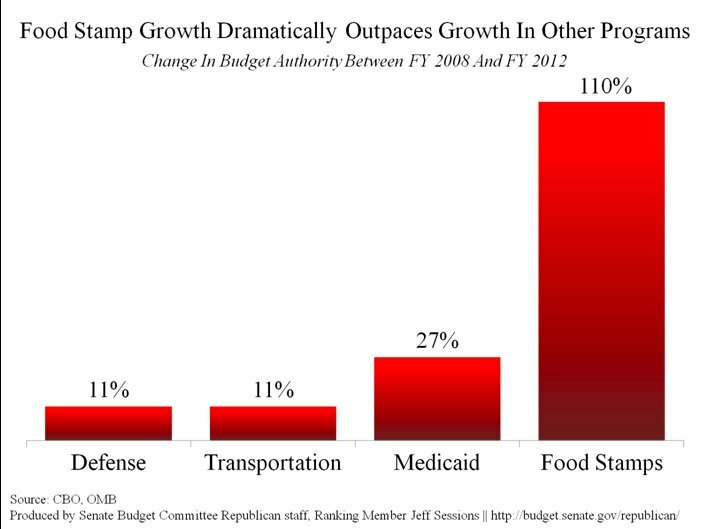 Of that nearly $1 trillion, 78% ($772 billion) will be spent on Food Stamps. “During debate on the Senate floor, I made a Motion to Recommit the bill back to committee with the simple instruction to split it into two separate pieces of legislation – a Food Stamp Bill and a Farm Bill. That motion was defeated by a vote of 40-59. Why are these measures combined? The answer is simple – to keep much of the legislation out of the light of day and to make spending $1 trillion far easier. The Supplemental Nutrition Assistance Program (SNAP), which is the fancy new name for the Food Stamp program, has doubled in under four years. Yet no one in government wants to really fix it, and risk looking like the bad guy. “Why do you want to starve poor people?” their critics will say. But when we look at the ways in which it is being abused, we really don’t have much choice. FNS (Food and Nutrition Service) proposes to amend regulations in order to provide States with options when clients request an excessive number of EBT card replacements. States would be able to withhold a replacement card until the client makes contact by phone or in-person with the State agency and provides an explanation for the excessive EBT card requests. The State agency would need to determine what it considers to be excessive, but the threshold may not be less than four card replacements requested within 12 months prior to the request; unless the State agency has sufficient, additional evidence indicating potential misuse that warrants noticing the client sooner than the fourth card request. These might be individuals about whom the State agency has gathered other evidence of suspected fraudulent activity. 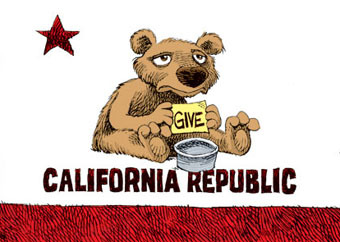 In these circumstances, the State agency may require the client to provide an explanation by phone or in person before the fifth card request……..
You can also see the focus of the Food Stamp bureaucrats when you look at who they are looking to hire. Are they hiring more fraud investigators? Bean-counters to lower the amount of money spent, maybe? Nope, just the opposite. 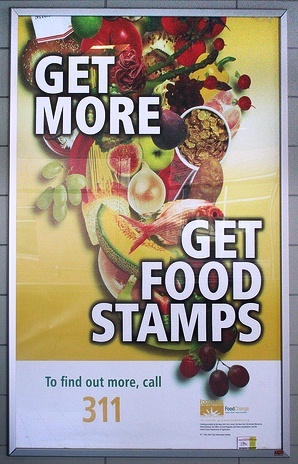 The purpose of outreach grants is to implement and learn more about effective strategies to inform and educate potentially eligible low-income people, who are not currently participating in the Supplemental Nutrition Assistance Program (SNAP), about the nutrition benefits of the program, eligibility rules, and how to apply. State and local food stamp offices and for-profit organizations are not eligible for these grants. Applicants receive up to $75,000 per grant for outreach activities lasting for 1 to 2 years, depending on the project. Yes, you read that right: $75,000 to come up with ways to bring even more people onto the government dole, and to get them hooked on just a little bit of “help” from Big Daddy. Because he cares, doncha’ know. Senator Johnson’s suggestion of splitting the bills makes perfect sense, but an even better way to deal with this would be to get it out of the hands of Federal Government altogether. Not coincidently, Johnson’s fellow Wisconsin native Paul Ryan has been suggesting that food stamps be handled by block grants to the STATES. It has been proven time after time: the closer you get the government to the governed, the better and more efficient it is for everyone. Such a loss of power & control is something the Federal Government, and this administration in particular, is not anxious to lose…..which is a sure indicator that it’s probably a great idea. The bill goes to the House this week. If this topic bothers you even a little bit, you may consider dropping an email to your Representative. And if this somehow doesn’t bother you, I’ll leave you with this little graphic, showing just how much Food Stamp spending has gone up, vs. other sections of the Federal Budget. Like Johnson said: “This is business as usual here in our nation’s capital, and it is bankrupting America“.